Baiame the sky spirit and Daramulan, are supreme South East coastal Dreamtime ancestors. Daramulan has one leg and lives in trees, the voice comes from thunder and was replicated by bullroarers in sacred ceremonies. Tree creeper birds and Nightjars represent the totem of Koori women on the east coast. Women become birds after death. The totems of Bats and Emu Wrens represent men. 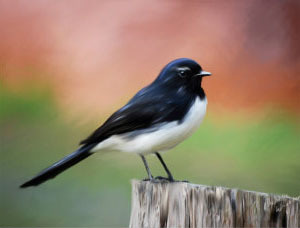 The White Winged Chuff (Duwan) is a bird that can bring bad news and the Willy Wag Tail can be a messenger of death.